Product shipping is an essential task for most all ecommerce merchants. And efficient and reliable shipping is one of the best opportunities you have to make a positive impression on your customers. Here is a list of shipping tools and resources to help your business. There are mobile tracking apps, calculators, packaging supplies, developer tools and APIs, and training resources and tutorials. Many of these tools are free. Track Packages. 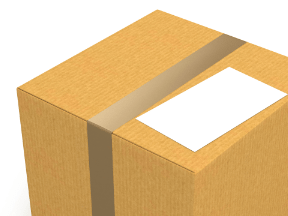 Track Packages iPhone mobile app is a package tracker for shipping, tracking and scanning UPS, FedEx, DHL and USPS packages. 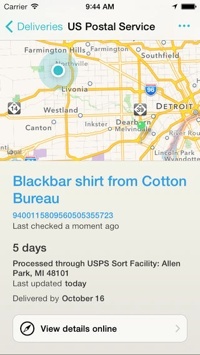 Produced by TrackPackages.com, the app includes a barcode scanner, push notification alerts, and a clean interface. It also provides a direct link to the individual package directly on the carrier’s website for further details on package status. Available for iOS. Price: $4.99. Delivery Status Touch. Delivery Status helps you keep track of your packages. The main view shows the latest status of all your packages. Tap a delivery for more package information and its location on a map. Delivery Status supports more than 30 services, including UPS, FedEx, USPS, DHL, TNT, Canada Post, City Link, Royal Mail, DPD, and many more. You can also track orders from services like Amazon and Apple, even before they ship. Available for iOS. Price: $4.99. Package Tracker Pro. 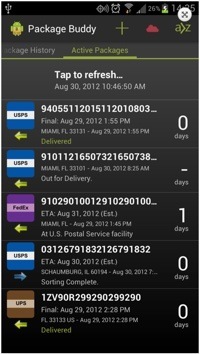 Package Tracker Pro is a mobile tracking application for Android. It tracks packages from 28 shipping services. Get alerts when a package is delivered. 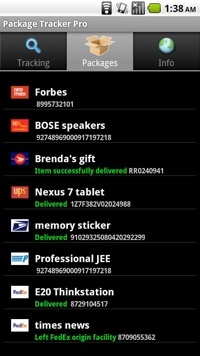 Sync tracking numbers between you mobile device and a free tracking management account at its website. Available for Android. Price: $1.99. Package Buddy. Package Buddy is a package tracking app designed to allow you to track your packages from more than 100 services. Pro users can sync tracking numbers with Package Buddy’s website to manage shipments. See a detailed history and a map of the progress for your packages. Price: Basic version is free. Pro is available through in-app purchase. Click-N-Ship for Business. USPS Click-N-Ship for Business is a free desktop software app for any business that regularly ships with United States Postal Service. It combines labels and package management operations in one tool. Compare rates, access labels, import label data from other accounts, and check delivery status. USPS Web Tools APIs. USPS Web Tools are free ecommerce application program interfaces (APIs) that can be utilized on websites, in shipping operations, or by customer service centers. Utilize the APIs for address information, delivery information, price calculation, shipping labels, carrier pickup, and more. Additional Developer Resources. 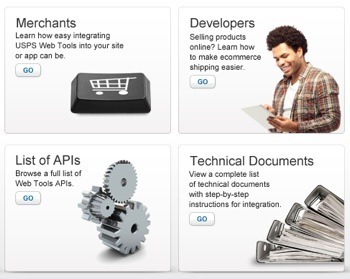 Each carrier offers tools to integrate its shipping solutions with your websites. Here are some resources for APIs and development tools: FedEx Developer Resource Center, UPS Developer Kit, DHL. Calculators. Shipping services provide calculators for domestic and international rate and time estimates. Calculators are particularly useful for comparing international rates. Here are links to shipping calculators at the major carriers: USPS, UPS, FedEx, DHL. 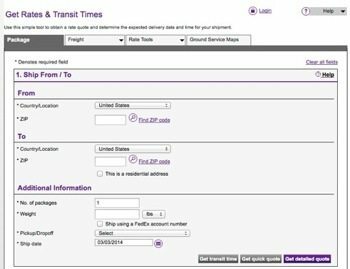 FedEx Rates & Transit Times Calculator. Free Shipping Supplies. Each carrier offers a selection of free packaging products for your shipping needs. Here are links to free supplies: USPS, UPS, FedEx. USPS Get Involved & Grow. The Postal Service offers training opportunities and assistance to anyone who wants to learn more about using the mail for cost-effective business growth. Get hands-on training with business mail, mail management, postal products and services, and tools to help grow a business. FedEx Small Business Center. The FedEx Small Business Center posts useful articles on a variety of shipping topics for small businesses. Find advice that can help you get things done, save time and money, and more. 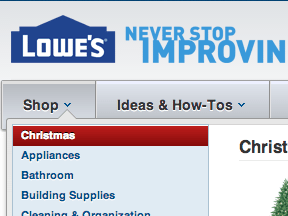 Customize your experience on the “Preferences” page, so the site offers info that’s useful to you. UPS Small Business Solutions. 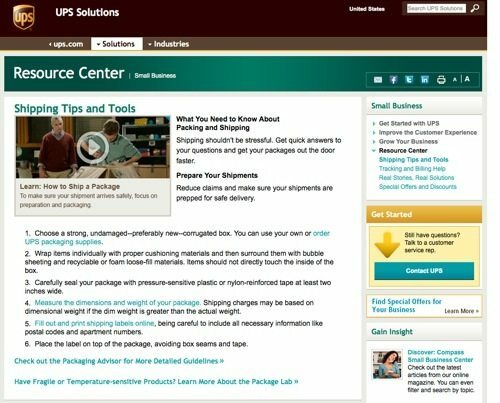 UPS Small Business solutions offers tools and tutorials to get started shipping, improve customer experience, grow a business, and find answers. You can view tutorials on packing and get detailed solutions from Packaging Advisor.